Copyright 1997 America Online, Inc.
OnlineHost: Copyright 1998 America Online, Inc. All Rights Reserved. 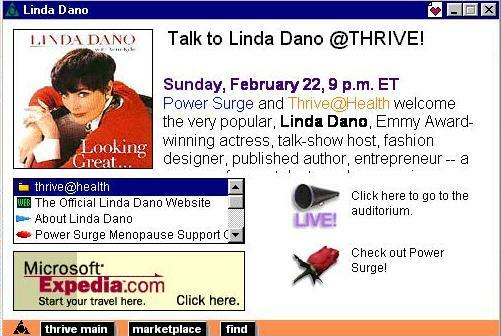 actress, talk show host, entrepreneur and published author, Linda Dano. Welcome Linda! And  Welcome Dearest! night. Thank you for visiting with me! makeup artist, a costume designer, a hairstylist can create glamour. the changes aging brings to our appearance? were so open and honest about your face lift. You really look great. now, would you do it all over again? LindaDano1:     A week after the surgery, I would have said ABSOLUTELY NOT! Three months after the surgery, I'd say "Yes, maybe!" of style. What is the one thing everyone should have in their wardrobe? only carry three articles of makeup, what would they be? day she were dressed like that? Comment: When did you decide to write a book? that really is my intent. Dearest: Wonderful... we have a question about "Attitudes"... audience? anything like that again. You are a great people person. "Attitudes" --  It was a lot of fun. much alike are the two of you? Comment:   What was youre favorite role to play? when did your career begin in TV? toes... I made a mistake...I guess I've been working about 22 years in television..
her do next on AW? remember, I dress, no matter what. mother. Want to elaborate on that? she lives with Frank and me and it's great. Comment:   Which soap star is the best kisser? to my knees kiss was the first time I kissed John Aprea.. oh my god! Dearest: Linda, we look forward to your new book next month, "Living Great." What subjects do you touch on in this new book? like you can cry right on cue! Is it hard to do that and how do you set the mood? Do you have any techniques before your emotional scenes? husband would say, I love to cry. women struggling to get back in shape. stuff you already know, I'm telling you, it's about how you feel about YOU. and if not how did you achieve this? But you have to believe it, you just have to. I'm almost 55 and I feel pretty good about myself do I think it will last?? Dearest: Linda, why on earth wouldn't you feel worthy? in the public eye all the time? Comment:  What's your daily fitness regimen? LindaDano1:   I go up and down the stairs all day long both at work and home. and NO ONE goes through a department store faster than me! (Stephen Schnetzer) got together on Another World? open for Linda's newest book by Putnam,  "Living Great," coming out in April. Crystal would say, "You look marvelous, darling, just marvelous!" Surge for hosting this event! Dearest: Thank you to you, Linda :) G'nite. you soon. KEEP THRIVING! AWESOME! OnlineHost: [Chat transcript is] Copyright 1998 America Online, Inc.